The Game Boy Color[a] (GBC) is a handheld game console manufactured by Nintendo, which was released on October 21, 1998, in Japan, and later released in November of the same year to international markets. It is the successor of the Game Boy and continued in the Game Boy family. The GBC features a color screen rather than monochrome, but it is not backlit. It is slightly thicker and taller and features a slightly smaller screen than the Game Boy Pocket, its immediate predecessor in the Game Boy line. As with the original Game Boy, it has a custom 8-bit processor made by Sharp that is considered a hybrid between the Intel 8080 and the Zilog Z80. The spelling of the system's name, Game Boy Color, remains consistent throughout the world, with its American English spelling of "color". 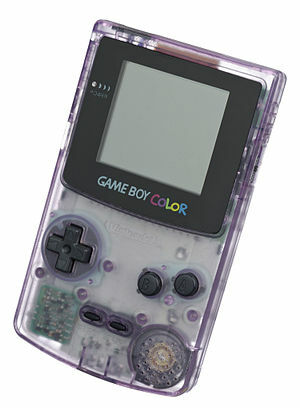 The Game Boy Color was part of the fifth generation of home consoles. The GBC's primary competitors in Japan were the grayscale 16-bit handhelds, Neo Geo Pocket and the WonderSwan, though the Game Boy Color outsold these by a wide margin. SNK and Bandai countered with the Neo Geo Pocket Color and the Wonderswan Color, respectively, but this did little to change Nintendo's sales dominance. With Sega discontinuing the Game Gear in 1997, the Game Boy Color's only competitor in the United States was its predecessor, the Game Boy, until the short-lived Neo Geo Pocket Color was released in August 1999. The Game Boy and the Game Boy Color combined have sold 118.69 million units worldwide making it the 3rd best-selling system of all time, a metric that includes Game Boy units. It was discontinued in 2003, shortly after the release of the Game Boy Advance SP, and so competed with the Game Boy Advance, which was released in 2001. Its best-selling game was Pokémon Gold and Silver, which shipped approximately 14.51 million combined in Japan and the US. The Game Boy Color was a response to pressure from game developers for a more sophisticated handheld platform, as they felt that the Game Boy, even in its latest incarnation, the Game Boy Pocket, was insufficient. 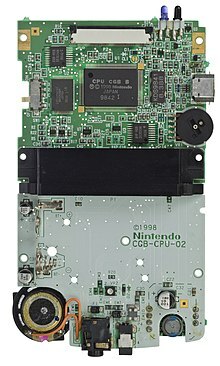 The resultant product was backward compatible, a first for a handheld system, and leveraged the large library of games and installed base of the predecessor system. This became a major feature of the Game Boy line, since it allowed each new launch to begin with a significantly larger library than any of its competitors. On March 23, 2003, the Game Boy Color was discontinued. The processor, which is a Zilog Z80 workalike made by Sharp with a few extra (bit manipulation) instructions, has a clock speed of approximately 8 MHz, twice as fast as that of the original Game Boy. The Game Boy Color also has three times as much memory as the original (32 kilobytes system RAM, 16 kilobytes video RAM). The screen resolution was the same as the original Game Boy, which is 160×144 pixels. The Game Boy Color also featured an infrared communications port for wireless linking. 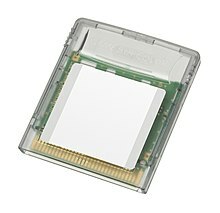 The feature was only supported in a small number of games, so the infrared port was dropped from the Game Boy Advance line, to be later reintroduced with the Nintendo 3DS, though wireless linking (using Wi-Fi) would return in the Nintendo DS line. The console was capable of showing up to 56 different colors simultaneously on screen from its palette of 32,768 (8×4 color background palettes, 8x3+transparent sprite palettes), and could add basic four-, seven- or ten-color shading to games that had been developed for the original 4-shades-of-grey Game Boy. 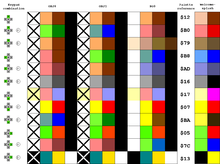 In the 7-color modes, the sprites and backgrounds were given separate color schemes, and in the 10-color modes the sprites were further split into two differently-colored groups; however, as flat black (or white) was a shared fourth color in all but one (7-color) palette, the overall effect was that of 4, 6 or 8 colors. This method of upgrading the color count resulted in graphic artifacts in certain games; for example, a sprite that was supposed to meld into the background would sometimes be colored separately, making it easily noticeable. Manipulation of palette registers during display allowed for a rarely used "high color mode", capable of displaying more than 2,000 colors on the screen simultaneously. For dozens of popular Game Boy titles, the Game Boy Color has an enhanced palette built in featuring up to 16 colors - four colors for each of the Game Boy's four layers. If the system does not have a palette stored for a game, it defaults to a palette of green, blue, salmon, black, and white. However, when the user turns on the system, they may choose one of 12 built in color palettes by pressing certain button combinations (namely a direction key and optionally A or B) while the Game Boy logo is present on the screen. These palettes each contain up to ten colors. In most games, the four shades displayed on the original Game Boy would translate to different subsets of this 10-color palette, such as by displaying movable sprites in one subset and backgrounds, etc. in another. The grayscale (Left + B) palette produces an appearance similar to that experienced on the original Game Boy. Illustrated color-samples of the palettes for the different key-combinations. Any color crossed out will be present in palette RAM, but rendered as transparent. A few games used a technical trick to increase the number of colors available on-screen. This "Hi-Color mode" is a mode used by the Italian company 7th Sense s.r.l. among others, and can display more than 2000 different colors on the screen. Some examples of games using this trick are The Fish Files, The New Addams Family Series and Alone in the Dark: The New Nightmare. The clear cartridge for exclusive Game Boy Color games. 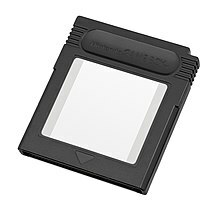 The black cartridge was for Game Boy games that took advantage of the Game Boy Color's increased palette but not the increased memory or processor speed. These games can be played on original Game Boys in grayscale. Game Boy Color exclusive games are housed in clear-colored cartridges, referred to as "Game Pak" cartridges. They are shaped differently from original Game Boy games. When inserted into an original Game Boy, these translucent cartridges prevent the system from turning on due to a missing notch present in original Game Boy cartridges that prevent the cartridge from being removed once powered on (barring the Rumble Pack games or Kirby Tilt 'n Tumble). While the Game Boy Pocket, Super Game Boy, Super Game Boy 2 and the Japanese-exclusive Game Boy Light do power on with a Game Boy Color exclusive cartridge inserted, these games display a warning message stating that a Game Boy Color system is required and refuse to play. In the cases of Chee-Chai Alien and Pocket Music, it however did power on with Game Boy Advance and Game Boy Advance SP, these games also display a warning message stating that a Game Boy Color system is also required and also refuse to play. Games that are designed for the Game Boy Color, but which also include backward compatibility with the Game Boy, Game Boy Pocket, Super Game Boy, Super Game Boy 2 and the Japanese-exclusive Game Boy Light, use the same cartridge shape as original Game Boy games, but are typically black and never gray. Another color released at the same time was "Atomic Purple", made of a translucent purple plastic that was also used on the color-respective Nintendo 64 controller. Other colors were sold as limited editions or in specific countries. Due to its backwards compatibility with Game Boy games, the Game Boy Color had a large playable library at launch. The system amassed an impressive library of 576 Game Boy Color games over a four-year period. While the majority of the games were Game Boy Color exclusive, approximately 30% of the titles released were backwards compatible with the original Game Boy. While Tetris for the original Game Boy was the best selling game compatible with the system, Pokémon Gold and Silver were the best selling games developed for the Game Boy Color. The best selling Game Boy Color exclusive game was Pokémon Crystal. The last Game Boy Color game ever released was the Japanese exclusive Doraemon no Study Boy: Kanji Yomikaki Master, which was released in Japan on July 18, 2003. In North America, Harry Potter and the Chamber of Secrets, released on November 15, 2002, was the last game released. In Europe the last game ever released was Hamtaro: Ham-Hams Unite! on January 10, 2003. The Game Boy and Game Boy Color were both commercially successful, selling a combined 32.47 million units in Japan, 44.06 million in the Americas, and 42.16 million in other regions. In 2003, when the Game Boy Color was discontinued, the pair was the best selling gaming console of all time. Both the Nintendo DS and PlayStation 2 would go on to outsell the pair and the Game Boy/Game Boy Color is now the third best selling system of all time and the second best selling handheld. ^ Japanese: ゲームボーイカラー, Hepburn: Gēmu Bōi Karā? ^ "モバイルシステムＧＢ". Nintendo (in Japanese). Retrieved September 23, 2015. ^ "The Nintendo® Game Boy™, Part 1: The Intel 8080 and the Zilog Z80". RealBoy. Retrieved August 29, 2017. ^ a b c "Consolidated Sales Transition by Region" (PDF). Nintendo. April 26, 2016. Archived from the original (PDF) on May 1, 2016. Retrieved October 23, 2016. ^ a b "A Brief History of Game Console Warfare: Game Boy". BusinessWeek. McGraw-Hill. Archived from the original on May 9, 2007. Retrieved March 28, 2008. ^ "Japan Platinum Game Chart". The Magic Box. Archived from the original on December 13, 2007. Retrieved September 27, 2007. ^ "US Platinum Videogame Chart". The Magic Box. Archived from the original on April 21, 2007. Retrieved September 27, 2007. ^ Umezu; Sugino. "Nintendo 3DS (Volume 3 – Nintendo 3DS Hardware Concept)". Iwata Asks (Interview: Transcript). Interviewed by Satoru Iwata. Nintendo. Retrieved March 7, 2011. ^ "Nintendo Game Boy Color Console Information – Console Database". ConsoleDatabase.com. Retrieved February 19, 2011. ^ a b "First Alone in the Dark Screenshots for Game Boy Color". IGN. August 4, 2000. Retrieved March 24, 2015. ^ "Changing the Color Palette on Game Boy Advance Systems". Customer Service. Nintendo. Retrieved January 4, 2009. ^ Albatross, Zen. "Game Boy Games That Pushed The Limits of Graphics & Sound". Racketboy. Retrieved March 24, 2015. ^ "Game Pak Troubleshooting - All Game Boy Systems". Nintendo of America customer support. Retrieved September 27, 2017. ^ "Kirby Tilt & Tumble - Cartridge". www.vgfacts.com. Retrieved June 28, 2018. ^ "プレイ日記　ゲームボーイ最強伝説　ちっちゃいエイリアン　近所のオバチャンに聞いたら「あのメグ・ライアンが絶賛した」とか言っていた！？？". valken.obihimo.com. Retrieved June 28, 2018. ^ "中古 [ゲーム/GB] ちっちゃいエイリアン (ゲーム... - ヤフオク!". ヤフオク! (in Japanese). Retrieved June 28, 2018. ^ "Gameboy Genius » Blog Archive » Pocket Music GBC version GBA fix". blog.gg8.se. Retrieved June 28, 2018. Wikimedia Commons has media related to Game Boy Color.